Gone to See Portugal. Street Photography Workshop with Steve Simon. Day 6: Lisbon, Portugal. We had free time in the morning to go out and shoot on our own. After a quick breakfast, I headed down to the river to catch the sun rising over the Tagus river. I made it just in time. Police blocked access to the; main square for more movie filming. This time for real, not practice and rehearsal. I managed to catch a bit of the motorcycle action from a block away before being chased off. 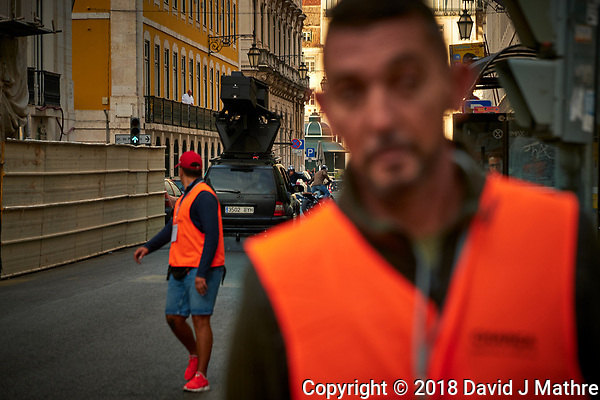 The new Fuji X-T3 camera stayed focused on the motorcycles even though the security guy with the orange vest kept waking toward me. I spent the rest of the morning getting high-resolution images using the Nikon D850 camera and 8-15 mm fisheye lens for high-resolution 360 degree panorama, little-planet view, and tunnel view; images. I only had time (and the computing horsepower) to process a few of these while in Portugal. The locations included areas I passed on the long walk from the subway station on Wednesday. I also found a large indoor farmers market in the Time Out building. After lunch we reviewed yesterday’s images, then attended a dinner with Fado performance. I nearly fell down the narrow stairs at the restaurant but was saved when Sean grabbed my shoulder. There were several signs in the restaurant forbidding photos and videos. I didn’t record the dinner or Fado performance. Funny thing, at least six other folks at other tables did record the Fado performance with their smartphones.